Hamstring is a group of tendons (tough and dense bands connect muscles with bones or other body parts) abridged by 3 posterior thigh muscles. They are semitendinosus, semimembranosus and biceps femoris and all of them work together to help in bending knees and extending hip. Semitendinosus is positioned at the back area of thigh between semimembranosus and biceps femoris. This particular muscle begins from ischium tuberosity’s inner surface to sacrotuberous ligament. This is an important one and in case it gets strained, the result comes in form of a pulled hamstring. 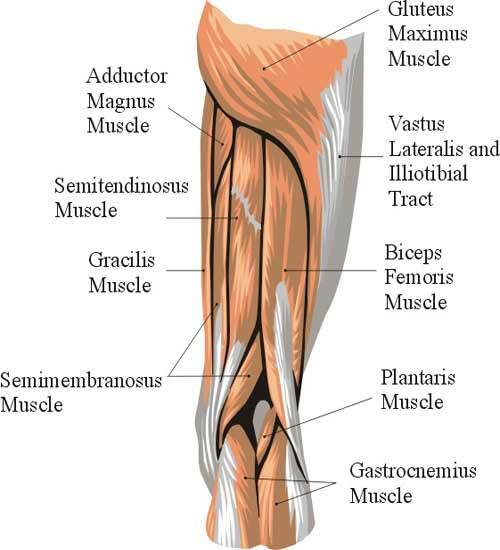 Semimembranosus is the second type of muscles included in hamstring and the place of it is at the back area of thigh. It begins from pelvis base to tibia, a bone that plays its role in making lower leg. If semimembranosus gets some kind of injury, it is considered hamstring injury and will need treatment. Biceps femoris is located at back side of thigh, also known as two-headed muscle because it is consisted of two parts i.e. long head and short head. Long head is found with the ischium while short head is attached with femur bone. The actual part of hamstring is long head which covers bigger posterior thigh area. For flexion of knees, extension of hips and both internal as well as external rotation requires biceps femoris to function properly; it can have pain which may be caused by strained, improper weight lifting and excessive exercise. It plays a very important role in daily routine activities like running, jogging, walking, jumping and many other movements. The major joints are hips and knees for which the hamstrings act. When your trunk is fixed, semitendinosus & semimembranosus extend the hip and flex the knees. When you begin walking, LH of biceps femoris muscle extends hip and both LH & SH flex and rotate the knees. It is also known as Dynamic Hamstring Stretch. This type of stretch is very popular and the main reason of its popularity is that you simply need to use your body rather than arranging some equipments. It is a kind of powerlifting, but there are various other muscles which can be trained with it such as glutes and lower back. The required equipment is bands. It is also known as clean-grip deadlift and it is considered to be an olympic weightlifting. Like the band good morning, it also works with glutes and lower back but few other muscles such as middle back, quadriceps and traps can also be trained with it. The required equipment is barbell. It is considered to be plyometrics type and it is also useful for adductors, abductors, glutes, calves and quadriceps. It is a compound workout and is another type of plyometrics. It is basically for beginners and works greatly for glutes, calves and quadriceps as well. No equipment is required to perform this exercise. This is also a very effective exercise to strengthen these muscles. It injury when strained or pulled. Those who play sports in which hamstring muscles are greatly involved such as basketball, soccer, football or tennis are more prone to develop injuries in this body part. After the sports, most of the cases of hamstring injury are found in runners and dancers. If you have got an injury, you will always be more prone to get another one in future; therefore, it is really important not to get back to your previous routine until you completely recover from the last injury and your muscles are stronger and healthier. In view of the some experts, another reason injury is imbalanced muscles; if you have worked harder to make your quadriceps stronger but don’t give proper time to your hamstring, this imbalanced might also cause injuries. In case of an injury, you might feel sharp and sudden pain in back area of your thigh. The second most common symptom is swelling & tenderness of muscles which is developed within a few hours. Sometimes, popping, tearing sensation, discoloration or bruising is also felt in back area of the leg. If your leg gets injured, you won’t be able to lift up weight because of weakened muscles. Strain is a very common problem, and unfortunately, it is quite painful in most of the cases. Though mild strains don’t normally hurt a lot, but more severe condition can be extremely painful for the sufferer and he/she will find himself/herself unable to walk, run or even stand. When your muscles are stretched beyond the limits, they begin to tear which results into strain and this condition normally develops during exercises as you have to do a number of activities. If you are not used to warming up your body before you do your regular exercise, this habit can also put you in a danger to get strained. Treatment to get relieved from hamstring strains completely depends upon the injury type and its severity. In case of a mild one, you might not have to do a lot to get rid of it, but if you have got a severe condition, you really need appropriate treatment. In most cases, hamstring strains can be treated very well with nonsurgical treatment. If you want to get rid of strain of muscles, you must take rest form all such activities that may cause strain, pain or pulled muscles. You can take support of crutches, so your legs don’t get pressure. Doctors also suggest the use of cold packs of ice for about 20 minutes. This can be practiced many times a day, however, avoid using ice directly to skin. Putting affected leg higher than the level of heart will be quite effective in eliminating swelling. Another suggestion is given by doctors is that the best way to prevent increase in swelling is to wear a compression bandage of elastic. Some patients are also advised to wear knee splint for a specific period of time as this will help in keeping affected leg in a better healing position. The next step is physical therapy of leg in which you will be asked to use some of the exclusive exercises to get back the lost strength and motion of your hamstrings. Surgical treatment is suggested for severe conditions in which tendon gets badly pulled out of the bone and there is no other way to deal with this problem.